FK chats to Lucy one half of the delightful Melbourne shop, Hut 13. Tell us about your wonderful store Hut 13 and what things we can expect to discover. 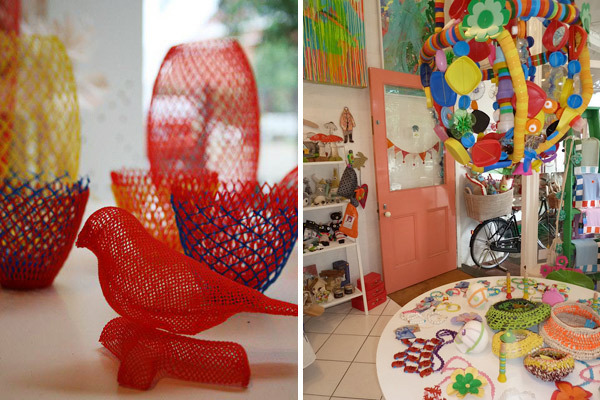 Our store is full of interesting hand crafted wares. We are constantly on the hunt for anything locally made with a particular craft/design element. 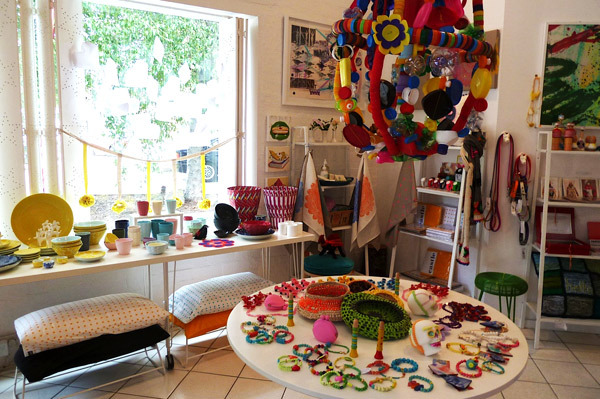 You can find ceramics, paintings, knitted sculptures, accessories, jewellery, glassware and toys. 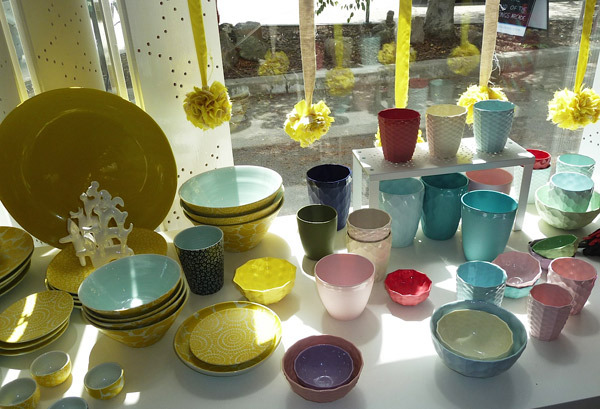 We both share a love for colour so our shop tends to be far from any beige tones. It is a happy place that makes you smile! What are your backgrounds and what lead you to where you are? I (Lucy) have a background in art and design and Melly has a background in food and catering (owner of Spoonful, Teaspoon and Sardine). Melly found particular joy in finding interesting kitchen home wares for Teaspoon so when the fabulous little store beside Sardine became available she approached me to join her in running a shop with her. I have had close associations with artists through my involvement with William Mora Galleries so sourcing our stock from local artists seemed natural to me. We tend not to stock from the trade shows to avoid the boring ‘sameness’ that exists in lots of Melbourne shops. 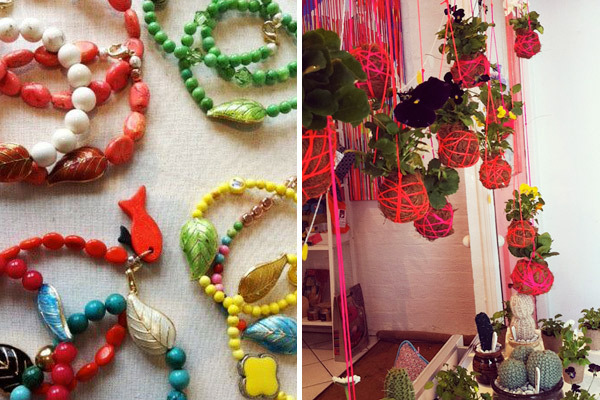 I spend a lot of time trawling craft blogs and going to design/craft markets. One of the most inspiring aspects of running Hut 13 is my relationship with its makers. Being a maker myself I understand the excitement and the pitfalls of the creative person’s life. I have met some fabulous people and that definitely makes the job interesting and fun. My makers/stockists feel a close association with the store. I always enjoy visits from our artists where we discuss new projects. I spend time walking my dog Digby and with my children. I like to be in my studio making things for the shop and working on window displays. If there is a craft market on I’m usually there! What do you love most about running Hut 13 and what have been some challenges? 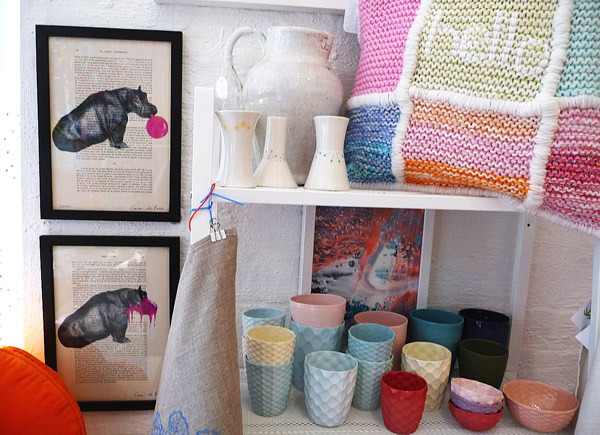 In running Hut 13 I am able to engage with a range of creative people, from the customers and lovers of art and design who come in to the store to the many talented artists we stock. Morey St is a lovely pocket of Melbourne to be in and it feels like a little village – this creates a nice atmosphere to work in. The biggest challenge has been keeping the store looking fresh and having new and interesting things coming in. We like the store to change and evolve rather than stocking the same things all the time. What new projects are you working on for Hut 13 for the remainder of 2012? The rest of the year is big for us! On 21st June we have a launch of Emily Green’s beautiful scarves where we will serve Sangrias, have a Gypsy band and the Taco Truck is coming! In July we are having an exhibition of Geoffrey Carran’s work. There will be 12 works from his bird series. Other projects are yet to be announced! I love that this place is in Melbourne, might pay them a visit! And Sardine next door has awesome coffee!